While much of the attention was focused on the Nexus 5X and Nexus 6P at Google's event today, these were far from being the only announcements. Last year, the original Chromecast took the world of media streaming by storm, introducing a low-cost entry point into streaming, and now Google has two new Chromecast devices to show off. 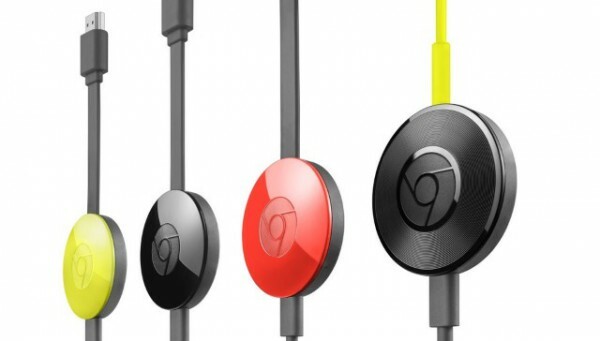 The new-look Chromecast has something of a different appearance to the first generation. This time around, the device is circular and features a short, flexible HDMI cable rather than the rigid design from last year -- this should make the dongle easier to plug into TVs with restricted space. There's also a new product in the form of Chromecast Audio which can be used to stream music to just about any set of speakers. Chromecast Audio is the audio-centric younger sibling of Chromecast. Just as the Chromecast dongle plugs into a TV to turn it into a media streaming center, so Chromecast Audio connects to your 'dumb' speakers to allow for music streaming. There's support for RCA, 3.5mm, and optical inputs making this quite a flexible device. Music can be cast from iPhone, iPad, Android phone or tablet, Mac or Windows computer, or Chromebook, and apps such as Spotify and Deezer also support casting. The second generation Chromecast now supports both 2.4GHz and 5GHz Wi-Fi for improved connectivity, and Google says the streamer is able to adjust signal as and when necessary to eliminate buffering problems. Whether you're streaming audio or video, an updated version of the Chromecast app makes it easier than ever to discover and stream content -- complete with playback controls -- and Google promises faster startup times when casting. Both the Chromecast Audio and new Chromecast are available from the Google store for $35 each.